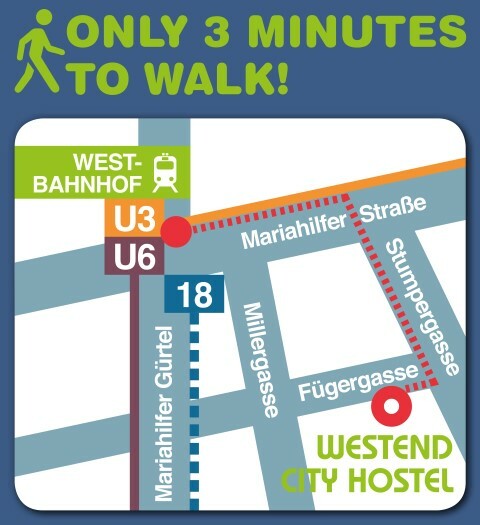 How do I get from Westbahnhof to Westend City Hostel? Long distance trains from the west of Austria, Germany, Switzerland, Hungary, Czech Republic, Slowakia, Romania, Bulgaria, Russia, Ukraine stop here. “Innere Mariahilferstraße” (towards city centre). On the „Christian Broda Platz“ take the first right onto “Millergasse”, then the first left onto “Fügergasse”. How do I get from Trainstation „Wien Meidling” to Westend City Hostel? How do I get from Wien Hauptbahnhof to Westend City Hostel? This will take you about 15 minutes. Take the tram line 6 or 18 to Westbahnhof. Across the road there is a big shopping street, Innere-Mariahilferstraße. Take the first right onto Millergasse, then the first left- Fügergasse. The “Hauptbahnhof” or main railway station is still under construction. Currently only regional trains from the eastern railway stop there. or get off at Trainstation “Wien Meidling” and take metro Nr. U6 to Westbahnhof (about 5 min). How do I get from Franz-Josefs-Bahnhof to Westend City Hostel? This will take you about 25 minutes. Take the tram No. 5 to Westbahnhof (terminal station). Accros the road there is a big shopping street, Innere-Mariahilferstraße. Take the first right onto Millergasse, then the first left – Fügergasse. How do I get from Vienna International Bus terminal “Erdberg” to Westend City Hostel? This will take you about 20 minutes. The underground line U3 takes you directly to Westbahnhof. Use the exit “Innere Mariahilferstraße. Take the first right onto Millergasse, then the first left -Fügergasse. How do I get from the airport to Westend City Hostel? 30-minute intervals going to Westbahnhof. Across the road there is a big shopping street, Innere-Mariahilferstraße. Take the first right onto Millergasse, then the first left -Fügergasse. How do I get from Stephansplatz (St Stephen’s Cathedral) to Westend City Hostel? This will take you about 15 minutes. The underground line U3 takes you directly to Westbahnhof. Use the exit “Innere Mariahilferstraße. Take the first right onto Millergasse, then the first left -Fügergasse. Is there a parking site for coaches near-by? 24 hours available in Hostel for 36 EUR max. 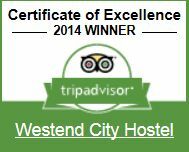 How do I get to Westend City Hostel by car? Where can I park my car? Go from Mariahilfer Gürtel Street to Gumpendorfer Straße, then left to Millergasse. The last street on the right side is Fügergasse. 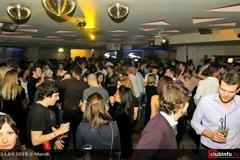 We can provide you with 24-hour-tickets in an underground parking near-by for 18,90 EUR. On Sundays and general holidays parking is free throughout Vienna.